• PLOT SUMMARY: THE HEROIC AGE IS HERE. The Marvel Universe Starts Here! Five killer creative teams present the dawning of five all-HEROIC ongoing series. Who will answer the call to rise up and defend the world? The answers are in these pages exclusively! You can't miss this first look at these new series that'll have everyone buzzing. Written by CHRISTOS N. GAGE, JEFF PARKER, KELLY SUE DECONNICK, and JIM MCCANN. Art by MIKE MCKONE, GABRIEL HARDMAN, DAVID LOPEZ, and KEV WALKER. Also featuring contributions by GIANCARLO CARACUZZO, JAMIE MCKELVIE, ALVARO LOPEZ and KARL KESEL. 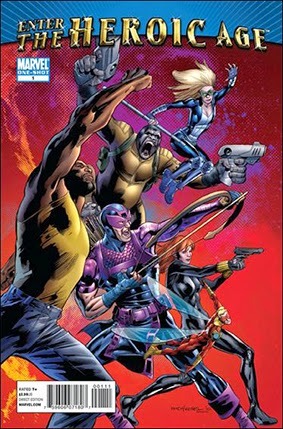 Cover art by Bryan Hitch.